After ‘Bruise Purple’ (aka ‘HeartWood’), Dulux Colour of the Year 2018, comes ‘Spiced Honey’ the proposal for 2019. 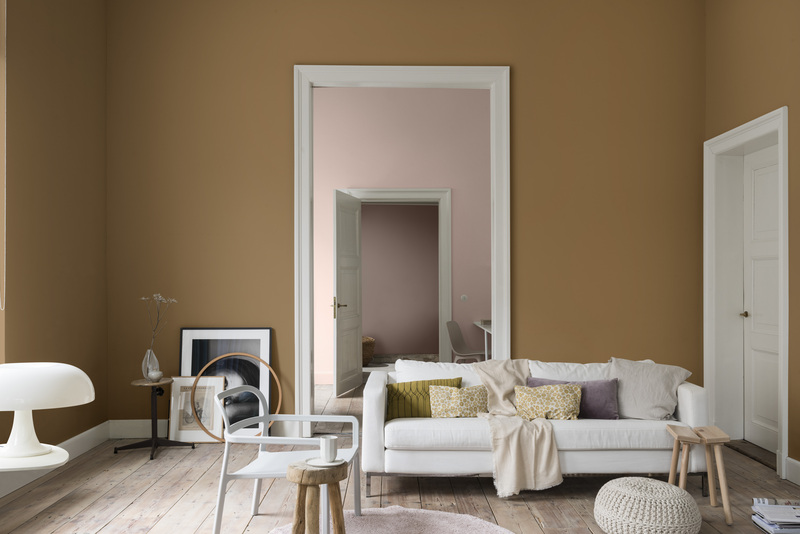 Described as being “inspired by the varied tones and remarkable properties of honey — natural, timeless and enduring, protective, rejuvenating and healing” it’s a warm tan tone, like “salted caramel with a hint of amber” in the words of Marianne Shillingford, Dulux UK’s Creative Director. But isn’t it just brown? And why might that be right for now? Well, as far as I’m concerned, I’m not sure that I’d leap to use this as a flat colour on my walls, despite the seductive photography, so I prefer to see it as representative of natural finishes and textures. As I suggested in my Trendbulletin ‘Posh Povera’ back in June, I believe we’ll see an increase in the use of “materials like rattan, cork, plywood, sisal and hemp with the twist being that they will be employed as if they were haute materials in the hands of master designers.” The point is a celebration of texture and tactility as an antidote to our increasingly smooth, screen-based worlds. Plus, all of these materials are freely available, economical to use and in addition tap into wider environmental concerns. Seen through that prism, ‘Spiced Honey’ is a harbinger of what’s to come (it is the 2019 colour after all), which I’ll probably be calling ‘Soft Scandi’. 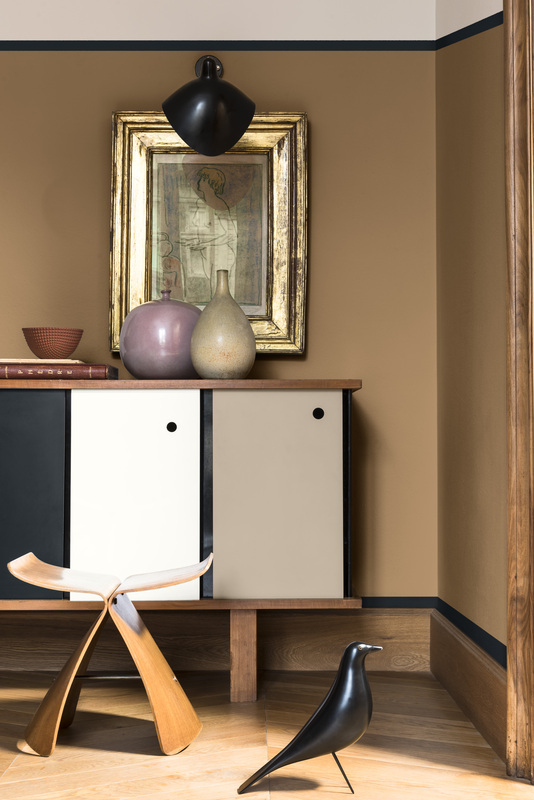 In other words, I predict a return to that perennial favourite and hitherto shorthand for cool, classic Scandi-style, however, its 2019 Trend iteration will be decisively updated with a gentle wash of colour learnt from the ‘New Neutrals’ and oodles of extra added texture, plus we’ll drop the love affair with grey. And in many ways, that’s what the images within this post seem to depict to me. After all, ‘Spiced Honey’ is not meant to be used on its own. In fact, the Dulux team devise four complementary palettes within which to sit the COTY (Colour of the Year) in order to demonstrate more fully how to use it. For 2019 they range from a set of ‘Warm Neutrals’ (think biscuity tones, including the enigmatically-named ‘Angora Blanket, nudes to burgundy with a dash of inky blue black). Then ‘Soft Pastels’ (various washes of grey blue to lavender, last year’s Heartwood, green greys and smoky brown). ‘Intense Pigments’ (here ‘Spiced Honey’ is paired with spice tones, sage green, teal and a nod to the pastels. Finally, ‘Bold Brights’ (representative of the ‘Happy Design’ trend, all vivid primary and secondary colours plus white). I’ve quoted so extensively from the report because frankly I couldn’t have put it better myself. My only point of difference is that I believe that this ‘societal awakening’ will come in tandem with homes increasingly focused on earthing us, literally grounding us, by reconnecting us to the natural world through the tactility of the materials that we surround ourselves with. Colours too for sure, but in truth, I’ll probably be adding more greens to my texture, than honey-hued browns. But how does it come to pass that Dulux come to such conclusions? Well, every year the company asks a team of top designers, architects, colour creatives and trend experts from all over the world to be its ears and eyes. Invited to the AkzoNobel Global Aesthetic Centre in Amsterdam (AkzoNobel is the parent company of Dulux), they share their forward-thinking insights with the Centre’s Creative Director, Heleen Van Gent, and her team in a series of day-long forecasting sessions. The idea is to build a picture of where the world might be going, highlighting key consumer trends and painting a prediction of the mood to be. The next step: translation of these insights into colour! One key shade to represent an overall sense of the year in question, and four complementary palettes. PS very excited to add as a footnote that I have been part of the invited team to work with AkzoNobel on the 2020 Colour of the Year! But my lips are now sealed until next year. Only then can I give you more insight into this unique creative process. 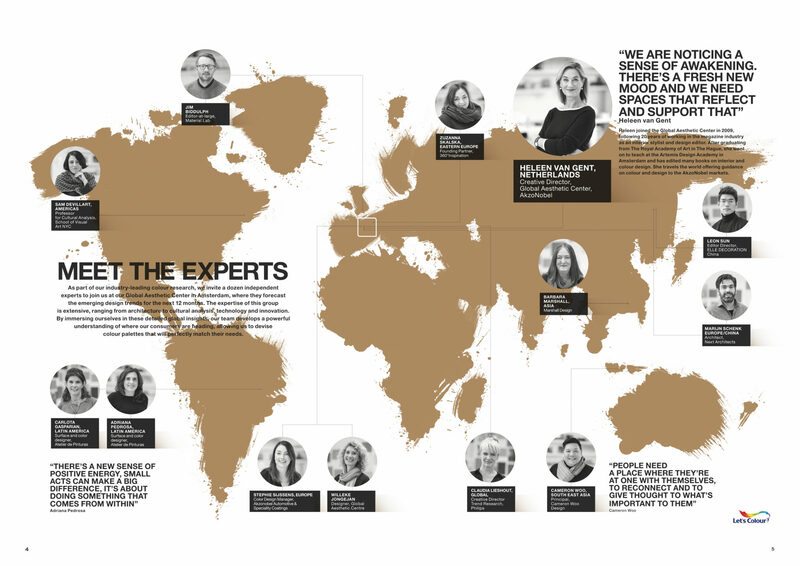 The current global panel of tastemakers invited to present their views on the upcoming trends subsequently translated into a colour! You can see more examples of hoe to use ‘Spiced Honey’ on the Dulux website here.